Wild Ride With Steve and Ben! Steve flashes a peace sign with his son Ben in the background on the ATV. I had quite a wild ride on Memorial Day with friends Steve and Ben. Steve’s the guy who built our house back in 2003. Ben is his son and did his share too. This is an important point, because that means these are two very fit people, as opposed to this desk jockey. They’re also experienced riders. One good thing about riding with experienced riders is they stretch my abilities and encourage me to try things I wouldn’t normally attempt. I only crashed three times—all at low speeds with no damage to me or the bike. 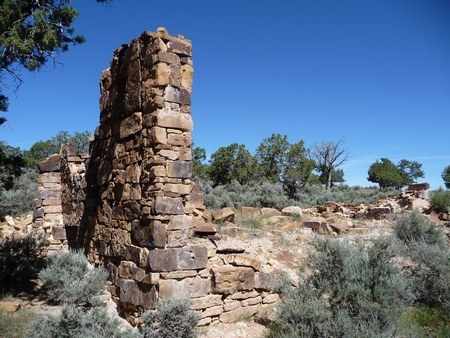 Sims Mesa, near their home, abounds in fascinating things to explore—see the pictures below. This is what remains of a homesteader's home. Not all the home was stone, unfortunately, because it's only the stone that remains. 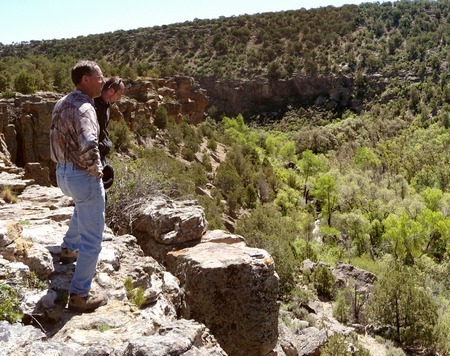 Here Steve and Ben stand on the edge of a cliff overlooking a canyon. Yes, we went down into the canyon, but not over the edge of the cliff!